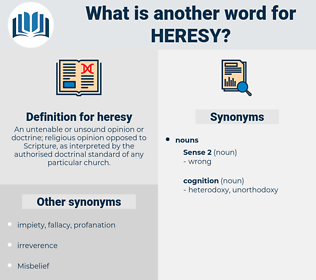 What is another word for heresy? 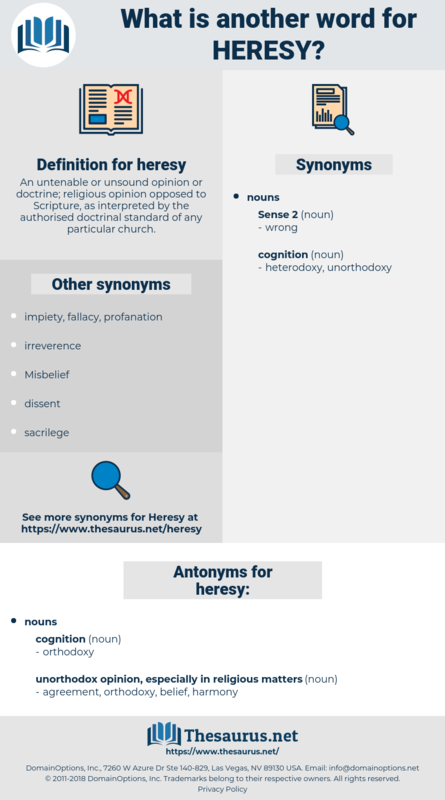 An untenable or unsound opinion or doctrine; religious opinion opposed to Scripture, as interpreted by the authorised doctrinal standard of any particular church. A heresy so easily overcome could not be very dangerous. Methinks heresy should nourish thy trade. Tritheism, Nestorianism, Docetism, Monothelitism, Catharism, Albigensianism, nonconformity, iconoclasm, nonconformism, Marcionism, Zurvanism, nonconformance, Pelagianism, arianism, gnosticism, Monophysitism. cognitive content, orientation, content, mental object.